Verfasst von pw am Di, 10/08/2013 - 22:01. 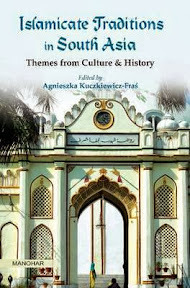 Islamicate Traditions in South Asia : Themes from Culture & History / ed. by Agnieszka Kuczkiewicz-Fraś. - New Delhi : Manohar, 2013. - 414 S.
AGNIESZKA KUCZKIEWICZ-FRAŚ, Assistant Professor at the Institute of Oriental Studies, Jagiellonian University, Cracow. Academia.edu profile. Kuczkiewicz-Fraś, Agnieszka [Hrsg.] (2013). Islamicate Traditions in South Asia: Themes from Culture and History. 414 S.